Properties in Cañada de Práez average 4.6 out of 5 stars. Modern Spacious House, Private Pool, Air Con, WiFi, Garden, Terraces, UK TV. Property 7: Modern Spacious House, Private Pool, Air Con, WiFi, Garden, Terraces, UK TV. CABO ROIG. Superb Beach/Golf Holiday Home in the Sun. South Costa Blanca. 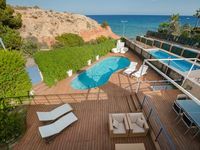 Property 10: CABO ROIG. Superb Beach/Golf Holiday Home in the Sun. South Costa Blanca. Zenia Beach - Luxurious and contemporary town house. Property 19: Zenia Beach - Luxurious and contemporary town house. Large 3 bed family holiday home. Free WIFI.Close to beach and pubs/restaurants. Property 38: Large 3 bed family holiday home. Free WIFI.Close to beach and pubs/restaurants. La Florida 2 bedroom, 2 bathroom spacious house. Property 45: La Florida 2 bedroom, 2 bathroom spacious house. Sunny premium holiday home with communal pool, sea view and free of charge. WiFi. Property 46: Sunny premium holiday home with communal pool, sea view and free of charge. WiFi.